I love Christmas, you love Christmas, we ALL love Christmas! But do we? Does every family member truly enjoy and relax over the festive period? Are you SURE that your dog is relishing this busy time? Or is it possible they find all the changes and socialising stressful? However, this doesn’t mean you have to come over all Scrooge-like over the holidays! Feel free to deck the halls and feed the masses, just make sure you include you canine family members and their well-being in your plans. Let them be selectively sociable! Many dogs enjoy the extra attention and fuss (and the fall out from the buffet!) but some will find a constant stream of visitors difficult to cope with. If they chose to say hello to your guests and want a fuss then that’s great but make sure you watch carefully for signs they are getting stressed. Things like like panting, hiding or becoming hyper can all indicate they aren’t too happy. Also be aware of young guests. 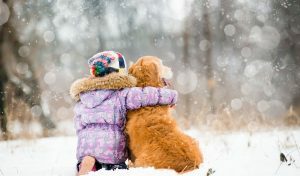 They are often desperate to be friends with the pets of the household but the feeling is rarely mutual, especially if your dog isn’t used to children! Create a ‘safe den’ for them to retreat to when they need a break. This doesn’t need to be decked out like Santa’s Grotto (in fact it’s probably best if it isn’t! ), just their normal bed under a cover is ideal. , Pop some tasty treats, like True Leaf Calming Treats and a couple of toys in there to keep them occupied and make sure both family and visitors alike know to not bother them. It’s hard, when there is so much other stuff going on, to keep to your usual walking and feeding routines but do try. 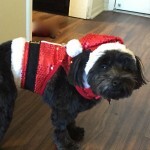 Again, the impact of change on your dog will depend on their personality. Some really rely on predictably, whereas others are more relaxed but it is worth trying to be consistent. Getting out and about will allow them to run off some steam, especially as a dog full of energy and a Christmas Tree full of baubles is not always the best combination! Often the Christmas weather isn’t that great for walking but getting some fresh air will be worth the effort! Also, tummy upsets are common at this time of year (nobody wants to be cleaning diarrhoea off the carpet on Christmas day!) So, try not to share those yummy goodies with your dog and keep to their usual meal times, so their digestion has the best chance of coping. In fact, why not buy some special treats just for them? So when you are enjoying your festive indulgences, they can too! Sometimes I think after catering for the five thousand, stressing about the decorations and managing Aunt Mabel’s penchant for the sherry and inappropriate comments, we could all do with something to calm our nerves! And for many of our dogs, they probably feel the same! Treats and supplements with ingredients to steady their nerves can be really helpful, as well as taking their mind off all the chaos! 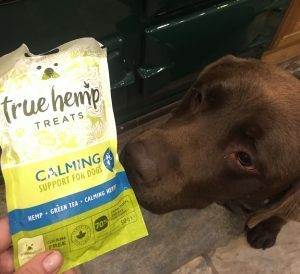 True Leaf Calming treats went down very well with my dogs! Check out the range of calming treats from True Leaf, containing omega-3 fatty acids, extracts of green team, camomile and lemon balm as well as fresh chicken and turkey! 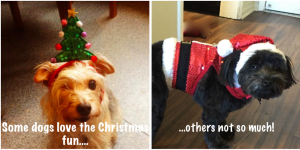 How do your dogs cope with Christmas? What do you do to help them? Share your tips and stories! ← It’s not the breed – it’s where they’re bred!